Take the Fight to the Streets! Despite our best efforts to contain it, the evil that possessed the museum has escaped. The streets of our shattered city are overrun with a pulsing vortex of alien radiance, as abominations pour forth into Arkham. The Gates of Arkham expansion provides new and horrifying Ancient Ones, monsters, and mythos cards that will challenge even the most seasoned investigators. 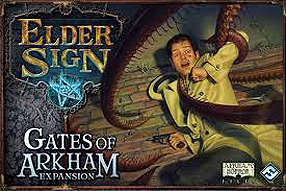 In addition to new allies, spells, and items that can be used while adventuring in the museum, the investigators, are presented with a new adventure set in the familiar streets and locations of Arkham. As gates to Other Worlds open across these new locales, investigators must utilise all of their resources to travel through and seal these eldritch portals before all of Arkham is consumed by this grasping dread.